We love this colouring in book with lots of small spaces to colour and bring to life! Colouring is great to practice using and controlling a pencil, especially if within boundaries. Box for Monkeys was started by a local, crafty mum who wanted to do fun and creative projects with her kids. Each box, delivered to your door, includes a mix of fun, creativity, educational elements and to promote interaction between parents and kids. Our pre-schoolers are loving this animal snap! It has pictures to represent the animals, the noises animals make and the names of the animals to match. Great to use as a writing game to work on letter formation or spelling – write down clues to guess a word or practice the letters as you guess. A fun shopping game for children 5 years and older. Help children learn about handling money and giving change, by playing this fun shopping game! We absolutely love these spy pens from Smiggle. Great for creating codes, drawing secret maps and writing! 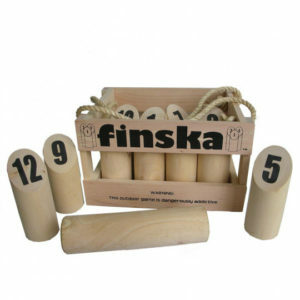 Great for practicing number formation to guess ‘hits’ on the board. Or use as a positive reinforcer for a task that is more challenging. Beautifully made, this bug about is great for ages 12 months to 3 years to scoot around the garden or house! These are great stocking fillers! A fun way to practise key mathematical operations. Play in a group by taking turns answering questions from the stack and checking answers on the colourful reverse. A great motivator when writing for longer periods of time. Can also used to reflect achieving a tricky goal – for example remembering to correctly form letters! A real challenge for hand eye coordination and great for developing pincer strength. Suitable for children 4 years and above. Your child’s inner musician will come to life with this set of 10 musical instruments to experiment all things sound! Suitable for children 3-6 years of age. A good activity to promote turn taking, being patient, learning to slow down and control hand movements to avoid knocking the tower over! The Suspend Game is a great family game of tricky hangs and steady hands. Suitable for children 8 years and older. Who doesn’t love the idea of a trampoline? If you are lucky enough to have a backyard – Kmart have some great, reasonably priced trampolines this Christmas. If you’re a fan of Sudoku, your family will love this colourful alternative. Instead of using numbers to solve the puzzles, Colorku uses brightly coloured wooden balls. A 3-in-1 design featuring blackboard, whiteboard and clipboard – great for promoting fun drawing and writing (children 2 years and above). This looks fantastic!! An interactive world of light and colour. Open all school holidays. Fun activity for children 5 years and above playing table top football. This is one of our favourite resources for learning vowel sounds from the fantastic Smart Kids. Suitable for primary school aged children. 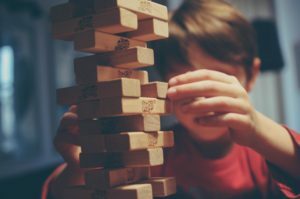 An addictive, unique and seriously fun wooden family game involving strategy and skill. Great for the whole family! This soccer themed note book is perfect for your sporty child from Smiggle! We love this magic cube for little hands. Each button adds an instrument to the orchestra. Delightful! A fantastic word search game. Earn points by spotting words on the grid before time runs out. You can turn this into a writing game by writing the words in sentences. A nerve racking game of skill and judgement. Choose carefully – pull the wrong one and KERPLUNK, the game is over! Suitable for ages 5 and over. Great activity for 2 players asking questions to try and guess the other person’s identity. Best for children 5 years and over. We love this game as a writing activity by writing the questions to each other! In the Operation game, you get to be the doctor and make Cavity Sam better or get the buzzer! Using a pair of tweezers promotes using pinching fingers. Make learning fun for your child and help them explore their creativity with this super brain putty. Work on finger muscles by rolling balls, snakes and pinching. A fun way to keep track of time, perhaps during homework or even to help with motivating during routine tasks like getting ready for school! If you are not familiar with John Heffernan, check out his website. He is a brilliant author with some wonderful and thought provoking adventures for children. This is story of one boy’s fight for the future of his country. Gorgeous story for little people about ten little elves off on a mission to rescue Christmas. This gorgeous, colourful book aims to teach kids how to tell the time. A delightful story! Best for ages 8-12, this is a brilliant series for children. A lovely collection of books with stories to help children understand different feelings including scared, angry, jealous, lonely, kind, loved and happy. An essential for all young children! Willy is kind and gentle, and bullied by the suburban gorilla gang who call him “Willy the Wimp”. Desperate to do something about his situation, Willy answers a bodybuilding advert and grows big and strong, determined no one will ever call him “wimp” again. It takes a very difficult, frustrating situation (a misbehaving creature) and teaches children how love, inclusiveness, warm attention and redirection can totally transform the wayward to the wonderful. A blend of storybook, puzzle book and numbers book. A moving and timely tale about how we all unknowingly affect the environment around us and how we can learn from our mistakes and find ways of doing things better. A beautiful picture book about a young boy’s adventures working as a paperboy on the busy trams, travelling to Bondi Beach. 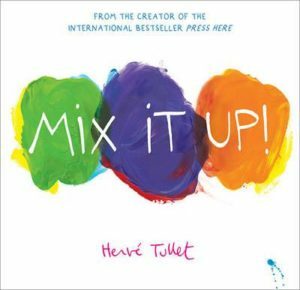 A super fun book that teachers all about colours and mixing colours. A joyful exploration of colour that will enchant young and old. Warning! This book looks serious but it is actually completely ridiculous! Give your kids a good belly laugh with this book with no pictures. Hortense is a kind and brave girl, but she is sad that her shadow follows her everywhere she goes. This illustrated story stirs the soul with its compelling, subtle exploration of self-esteem, self-identity, and finding inner strength.